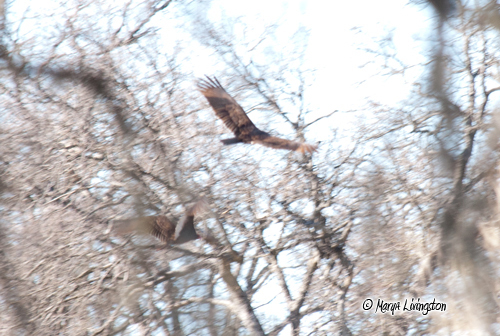 In my last post, I noted that I was trying to capture a breeding shot of the turkey vultures. 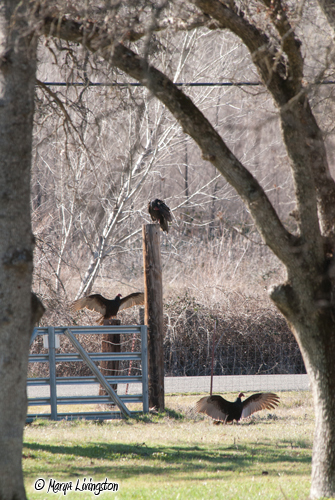 As I was cleaning my painting table, I noticed a vulture perched on the gate at the lower field, two on posts, and one on the ground. Surely, there must be a nesting pair amongst this crew. I grabbed the camera and sneaked out the office door and around the side of the house. The one on the gate spread its wings, as vultures often do when sunning themselves. The posture was a bit more intimidating than the usual bask in the sunshine. Then the one on the ground spread out its wings. Then the one on the gate literally flung itself onto the intruder. The fight was on. The fight initiator chased the other through the trees, across the big pond, and up the hill. 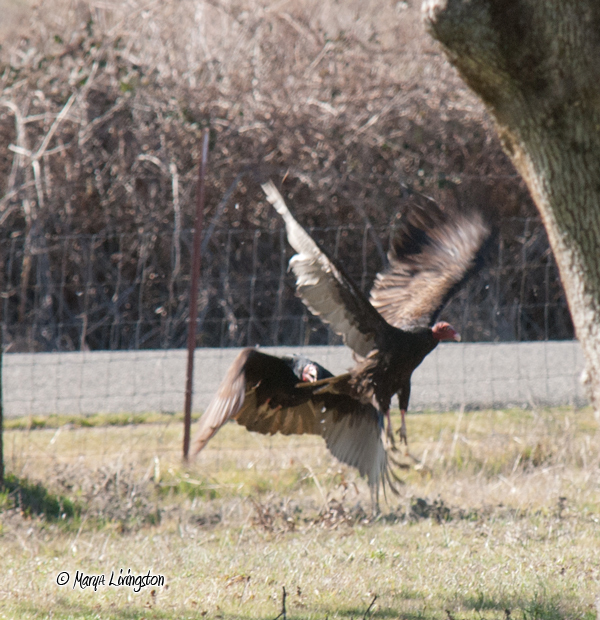 Then the victorious vulture flew into the nest tree and fluffed its feathers in a display claiming the nest site. Interesting goings-on in my backyard. Vultures gather by at the lower gate. Two offer a display. 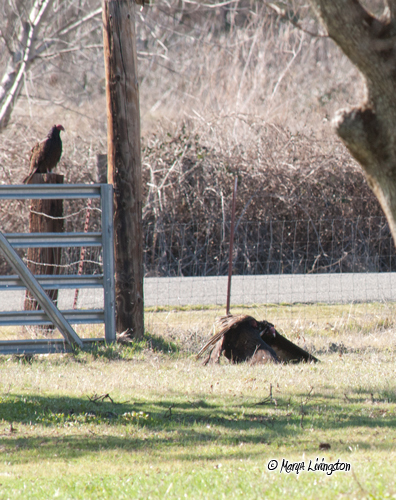 The vulture on the gate pounces on the other. Th vulture delivers a parting shot (bite). The intruder is chased away. 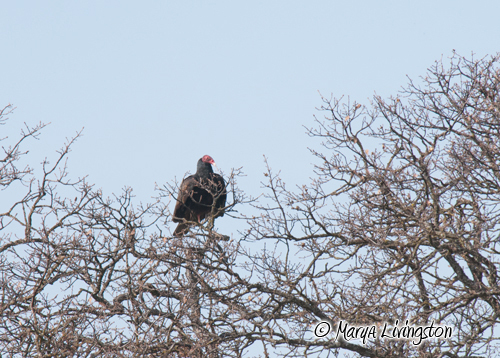 After successfully chasing the intruder away, the vulture perches in the nest tree. 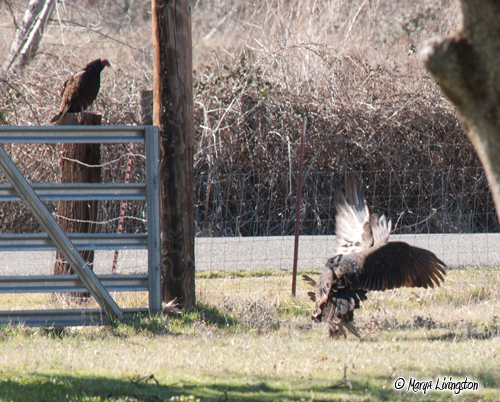 This entry was posted in Nature, Nature Art, Photography, Turkey Vultures and tagged nature, photography, turkey vulture fight, Turkey Vultures by MaryALivingston. Bookmark the permalink. I would have thought they were attacking each other! This has been an interesting week in your backyard. I’m so glad you captured this in word and photograph. I feel like I’m there. I am enjoying this mini series. Do you plan to create a trailer or video to announce your upcoming book? You have real-life footage. When will your vulture book debut? Is the publisher and title something you can share? I’m definitely interested in it. Hopefully, many other followers are too. They are absolutely huge birds! The wingspan is about 6 feet. Great photo sequence of vultures in action. These are interesting. do you know that vultures in India have almost become extinct? And all due to a drug called Diclofenac, which was used liberally in large animal practice as an anti-inflammatory agent. Though it had no effect on the animal, at least not an adverse one, when the vultures fed on carcasses of cattle that had been injected with this drug, it led to crystallization in their kidneys causing their deaths! I was reading an article about this recently. Are efforts underway to stabilize and rebuild the population? Vultures are so critical in the role they play. High drama! Looking forward to developments. A nice photo account of territorial behavior. King of the hill/tree-tops! Wow! Those are incredible pictures! We have lots of those vultures around here. The Mom Person finds them pretty fascinating. Me not so much. They worry me when they’re on the ground or fly low. Not to sound gruesome, but they are not likely to bother you while you have a heartbeat. Another fascinating tip, they prefer vegetarian carrion. Well, that’s good to know! I still don’t like them too close.